Video Updates would like to welcome filmmaker extrodinare and newest contributor, Greyduck. 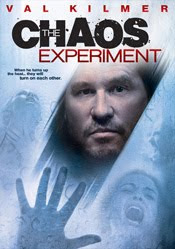 Whereas terminal disease guy in the Saw movies traps his victims in elaborate torture devices to make them value their lives, James Pettis (Val Kilmer) traps his victims his victims in a sauna to make them feel like what global warming might be like someday. His 6 victims (who include Eric Roberts and Patrick Muldoon) introduce themselves in one of the most pretentious, of many pretentious sequences, showing them through a dense yellow filter, in split screens that dissolve over more shots, that dissolve over even more shots. Needless to say, this overwhelming presentation doesn’t really leave us caring much about the characters or their fate. There’s angry Brooklyn guy, slightly older sagely guy, other guy, shy girl, seemingly normal girl, and skanky girl who walks around with her top off, while “Bolero” by Ravel booms on the soundtrack. Yes, we get it. It’s very warm in there. We find out they’re all in the sauna as some part of dating service, although none of them seem particularly interested in making a good first impression. Pettis goes to some talk to a guy with the press and a police detective about his little scheme with the people in the sauna, who will eventually be slowly steam baked to death and he explains he will only let them go if the paper publishes his findings on global warming, which of course will be unbearable in 2012. So Val is playing so sort of evil, insane Al Gore. The folks in the sauna bicker. 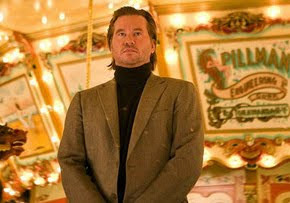 Val as Pettis continues to ramble, and the movie randomly cuts to shots of him alone on a spinning carousel, starring off blankly. I think this is supposed to re-iterate the fact that he’s crazy with a capitol C.
Here’s where I take an extended phone call from a friend I haven’t heard from a while. I come back to find that not much has changed, and Val has gone from crazy to insane, or insanely constipated, judging by the way he’s biting his lip and twitching. I’ve got to say, Val in this movie is just terrible, mostly due to the poor writing and directing, which is unfortunate, since he’s great in “The Doors”, a favorite film of my teen years, And I’m sure he’ll be good in Werner Herzog’s Bad Lieutenant: Port of Call, New Orleans (although, movie titles should never have semicolons in them... ever) Steam Experiment was certainly directed by no Werner Herzog, but by Philepp Martinez, who’s previous works include a Jean-Claude Van Damne movie, which is always a bad sign. I digress. Anyway - SPOILERS ahead. Very lame ones. Nails shoot through the door to the sauna, the people in the sauna get freaked out, and become more angry (hot under the collar, if they were wearing collars), and as Pettis’ theorized, begin to fight amongst each other. Shy girl slits her own throat, other die due to barely motivated quarrels, somebody gets a nail gun to the head. It's a whole-lotta chaos going on. As Pettis continues to look more constipated and ramble on, the detective decides he’s just totally bananas and the “Steam Experiment” is just something he made up in his head to get attention and the people in it don’t actually exist. Exit detective. The twist isn’t that they are all in his head, (for that movie, see Identity AKA “The 3”) the twist, I guess, is that Pettis’s mental ward doctor guy is also sorta crazy and is in on the experiment. He’s the the one who shot the nails through the door with a nail gun. Seemingly-normal-girl survives the experiment and we find out that she is the psychologist’s wife. Why did she participate? We’re not entirely sure. Why did his doctor help set up the experiment? We don't know. Pettis goes back to the the mental institution and lies around looking beardy. Is he crazy? Cut to him spinning around on a carousel again by himself... OK, yep = crazy, in case we forgot. 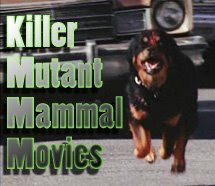 I'm not really sure what the film was trying to say. Probably check the history of any dating service you sign up for, and don’t let them convince you to start your date with a bunch of strangers in a creepy sauna. I don't know why I kept thinking you were going to write about The Genius Club. Maybe because they both involve washed up actors getting locked in places and are only rescued from total obscurity by their reputations for being incredibly terrible. Pettis' doctor was Chris the male nurse, right? So, he couldn't have shot the nail gun, right? I am guessing Pettis was on the outside to rescue Chris and Catherine - and Pettis shot the nail gun. Very confusing. Real Genius is the gold standard of Val Kilmer movies. Or perhaps Top Secret. It's been kind of downhill from there.